All elite operators have one thing in common: a mastery of the basics. Our Tactical Carbine Courses are engineered to provide AR owners with the skills and habits needed to forge exceptional shooters. The carbine can be an incredibly effective self and home defense platform. Six Tactical’s Carbine Courses are therefore designed for both novice and experienced AR owners. 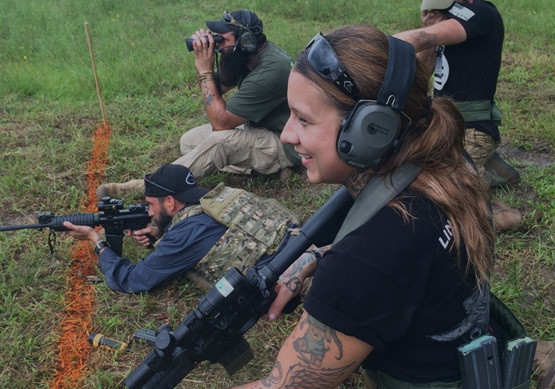 The courses provide beginners with the groundwork to achieve a high standard of proficiency while veteran shooters will break bad habits and get faster! We start by building sound fundamentals. Our progressive skill development methodology employs the “crawl-walk-run” approach to training: each block of instruction builds on the material presented in the previous block. During each three-day program of instruction, our world-class instructors will work closely with each student to ensure that they have the concepts, information, skills and support necessary to master the fundamentals of the AR platform. Six Tactical is unique in that we believe building exceptional shooters requires a cerebral element of training. Students’ time on the square bay is complemented by comprehensive classroom lectures on marksmanship physiology; internal, external and terminal ballistics; and the psychology of violence. Our staff of former U.S. Special Operations personnel are some of the country’s most effective and experienced riflemen and carbine practitioners. Everything we teach, we teach for a reason; our curriculum is supported by case studies and is comprised of the best practices to provide a tactical advantage in real-world defensive situations. The Six Tactical staff provides a personable and low-stress environment for all shooters looking to improve their skills. Regardless of age, experience or ability, we have two objectives: train and mentor shooters to the highest standards of small arms proficiency and have fun!